Triangle Quartet review | What Hi-Fi? Why do you listen to hi-fi? Is it about revealing every detail in as neutrally as possible? Or is it about being entertained? If it’s all about entertainment these floorstanders are exactly your kind of speaker. French firm Triangle has never tried to please everybody: its speakers are crammed with attitude, and if that upsets those who place qualities such as transparency on a pedestal, who cares? Its products are all about music, and the Quartet is one of the finest ambassadors of that message we’ve heard at the price. They’re sensitive, as the 92dB/W/m rating suggests, so they’ll deliver good volume levels with lower-powered amplifiers: amp quality matters more than power output with these speakers. The unusual tweeter grabs our attention first. It’s a horn-loaded 25mm Titanium dome covered with a phase plug to help even out its directivity and phase response. Its position at the top of the cabinet reduces diffraction issues. All three of the larger drivers are 16cm units. The two woofers use fibreglass cones and the midrange, a cellulose pulp cone – a fancy name for treated paper. The midrange has an unusual pleated surround to help reduce distortion and allow it to cover a wide frequency band. As is usual for Triangle, it operates within relatively wide limits, working from around 3kHz down to 350Hz where it hands over to the bass drivers. These bass drivers would usually be tuned by a dedicated port each. In the Quartets, both drivers are loaded by a cleverly engineered split port. The design works well, judging by the quality of the bass produced. All this clever engineering results in a wonderfully dynamic and engaging performance. The Quartets are vivid, with timing as secure as an atomic clock. That might not sound particularly exciting, but it means these speakers sound composed and controlled regardless of the material fed to them. Something rhythmically complex such as Babel from Massive Attack is delivered with fury as well as control. There’s plenty of enthusiasm here, too – and that’s rare with high-end kit. The Quartet’s bass is equally impressive. It’s taut, precise and has admirable agility. 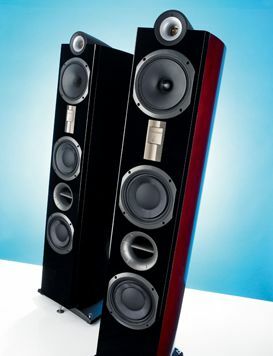 It could be argued that a speaker of this size should have even more low-end heft, but such is the quality of the Triangle’s lows we’re more than happy with the balance chosen. Other plus points include high detail levels and superb integration between the drivers. As with other Triangle speakers that we’ve heard these are a fair way from being tonally pure. They don’t have the sweetest treble around either, despite all the clever work done on that horn-loaded tweeter. But still, they’re nothing if not fun to listen to. Moving on to build and the news is generally decent. By the highest standards these speakers aren’t particularly luxuriously finished, but they are good enough to avoid serious criticism. The only area open to serious complaint is the spike arrangement. The threaded holes in the speaker plinths are poorly machined, and the overall arrangement isn’t particularly neat. But that’s not enough to dent our enthusiasm. If you want lively and engaging, few alternatives do it better.